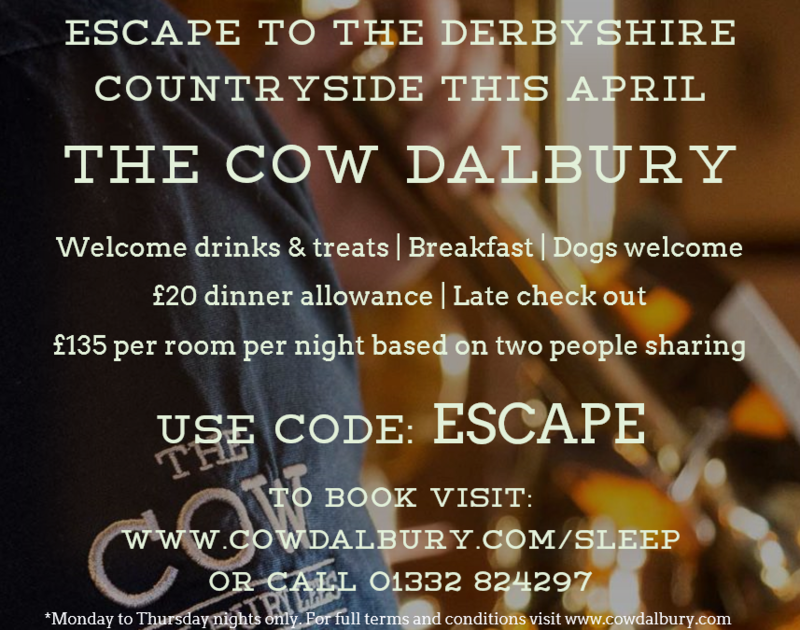 Escape to the Derbyshire countryside for two this April with a mid-week stay at The Cow Dalbury. Don’t forget to quote promotional code ESCAPE to qualify. If you prefer to book over the telephone, please call our friendly team on 01332 824297 and quote ESCAPE. *The April Escape offer is valid for bookings between 1st – 30th April 2019 on Monday to Thursday nights only. To qualify for the April Escape offer the promotion code ESCAPE must be used. All bookings are subject to availability. A £20 food allowance is included with ‘April Escape’ and can be redeemed on food only during the evening of the overnight stay and cannot be transferred to any other date. Only one £20 food allowance per stay. No refunds or change will be given should the value not meet the allowance of £20. Any extra spend must be paid in full during the stay. The promoter reserves the right to end the ‘April Escape’ promotion without notice. The promoter is The Cow Dalbury, The Green, Dalbury Lees, Ashbourne, Derbyshire DE6 5BE.